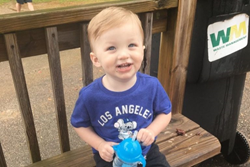 Karen Miller, CEO and owner of the Karen Miller Agency, is announcing the launch of a charity campaign intended to raise support for the family of Kai Hawkins, a local two year old boy recently diagnosed with leukemia. Kai has begun an aggressive regimen of chemotherapy, and funds raised will be used to help the family pay for his ongoing medical care. “We want to do all that we can to help ease the burden for this loving family and focus on what matters most during this challenging time, which is Kai’s speedy and complete recovery,” said Miller. The Miller team is asking all residents in the Jefferson County region to be part of the charity drive by sending friends or family members into the Karen Miller Agency to receive a complimentary insurance appraisal. For each person referred, Miller will issue a $10 donation to help pay for Kai’s treatment. Further information on how to help the Hawkins family during this charity event can be found here: http://karenmilleragency.com/rewards/. As a Personal Insurance Representative in Helena, agency owner knows many local families. Her knowledge and understanding of the people in her community ensure that clients of the Karen Miller Agency are provided with an outstanding level of service. Karen and her team look forward to helping families protect the things that are most important – family, home, car and more. The Karen Miller Agency also offers clients a preparation strategy for achieving their financial goals. To contact an expert at the Karen Miller Agency, visit http://karenmilleragency.com/ or call (205) 620-1120 in Helena or (205) 988-3131 in Hoover.